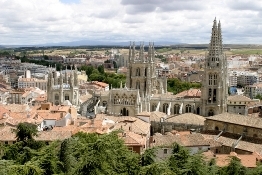 Car rental Burgos is the perfect way to explore this beautiful city! Using our car rental form you can get rent a car at best price ever – we compare car rental companies at 30,000 world locations to find your dream rental car at cheap price. We offer you car rental spots Burgos Train Station, Aranda De Duero Downtown (see full list below). Now you don’t have to compare car rental prices – we’ll give you entire info about world car hire suppliers in one second to make your vacation comfortable! The old part of the city begins with the arch of Santa Maria which is in the city walls dating XV century. With our car rental in Burgos you can easy get to the center, go up to the local castle, see the famous Burgos church, visit Real de las Huelgas monastery, and visit the city archaeological museum. RentalCars24h.com offers you reliable car rental Burgos services that will help you to feel free and independent when moving around the town. Providing best online prices for car hire Burgos services, RentalCars24h.com allows you to save money each time when you rent a car in Burgos.